The lotion in each of these masks contains plentiful quantities of moisturizing ingredients. Each package contains 20 masks. Keeping your skin moisturized is an important aspect of skin care, since when skin gets too dry it can become rough and painful. These masks provide a quick and easy way to moisturize the entire face all at once, and will help to keep your skin vibrant, soft, and translucent-looking. Each mask comes suffused with plenty of lotion, made with a luxurious combination of 3 kinds of moisturizing hyaluronic acid (sodium hyaluronate, sodium acetylated hyaluronate, and hydrolyzed hyaluronic acid). And because the lotion is transferred directly from the mask to your skin, you don’t have to worry about applying too much or too little lotion, waiting for the lotion to dry, or getting lotion into your eyes or mouth! Since 20 masks come in every package, they can be used easily for day to day skin care with plenty of time to restock before they run out. The packages are compact as well as resealable, making them convenient to store when not in use and convenient to pack when traveling. 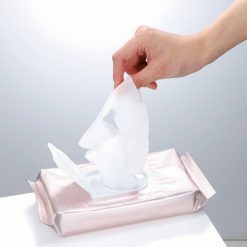 After washing your face and hands, pull one of the masks from the package and unfold it carefully. Align the openings with your eyes and mouth, and place the mask on your face. Allow 5 to 10 minutes to pass, then peel the mask off and use the palms of your hands to smooth any moisture it has left behind into your skin. This product contains water, butylene glycol, glycerin, sodium acetylated hyaluronate, hydrolyzed hyaluronic acid, sodium hyaluronate, atelocollagen, tremella fuciformis polysaccharide, Polyquaternium-51, glycerylamidoethyl methacrylate/stearyl methacrylate copolymer, xanthan gum, polyglyceryl-10 laurate, phenoxyethanol, citric acid, sodium citrate..